The 'V' came from the German word Vergeltungswaffen, meaning weapons of reprisal. The first doodlebug or buzz bomb as they were nicknamed to target London, crashed and exploded Grove road near Mile End park in East London. Of course, deception wasn’t the only tactic used to defend Britain. ‘British Home Defences 1940-45’ attests that the Commander-in-Chief of Anti-Aircraft Command was given permission to move the bulk of his defences, including guns, Nissen Huts, troops and equipment to the South Coast, so that as many Doodlebugs as possible could be headed off before they had a chance to get anywhere near London. With the help of the US SCR 584 Ground Controlled Interception radar and the proximity fuse, developed by a British and US collaboration, their hit rate leaped to 75%. It certainly helped, too, that the Allies were now making good progress into France. 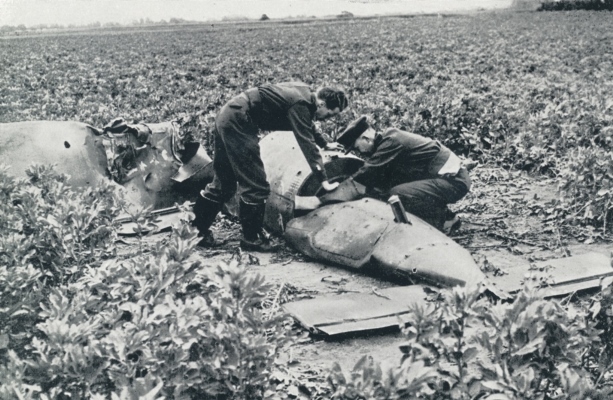 As more French territory was taken over, less potential launch sites remained for the Germans to fire from, although they then tried launching from Holland or from aircraft over the sea. Memorials to the victims can be found across London including the site in Chiswick where the first rocket struck and at the site of Woolworths store in Lewisham where 168 people were killed on 25th November 1944. Discover more about the attacks on London by Hitler Vengeance weapons within the publication “The Battle of South London” from the Forces War Records Historic Library. “The Battle of South London” from the Forces War Records Historic Library.